During our Kaiser strike in December, Stationary Engineers, Local 39 and the California Nurses Association allowed their members strike in sympathy, which made our action even more powerful and impactful on Kaiser. 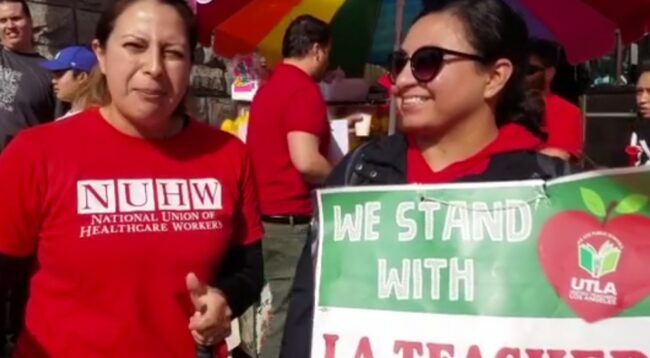 In January, when teachers went on strike in Los Angeles, many NUHW members headed to the picket lines to offer their support. “Nancy Morales, a medical social worker in San Bernardino, marched with her friend, a psychiatric social worker for the school district. The teachers’ open-ended strike resulted in a contract that included a 6 percent raise over two years and many gains for students including: smaller class sizes and the hiring of more counselors, nurses and librarians.